With a child in fourth grade, we have been learning about multiplication for quite a while now. Whilst Miss 9 has a good grasp of multiplication as a mathematical process, we are still working on memorisation of times tables for quick recall. Some of the multiplication tables she mastered super quickly, but others have proven more of a challenge, requiring a lot more repetition to crack. 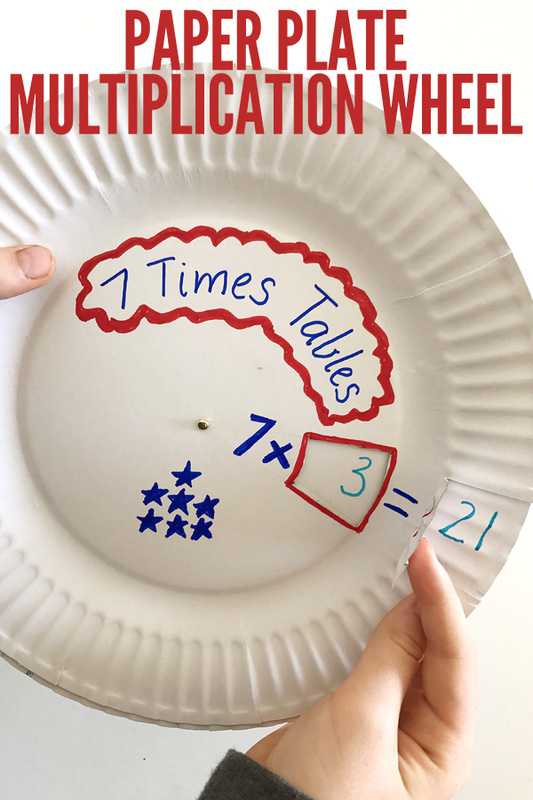 I am a big fan of using all sorts of different multiplication games and fun resources to keep the learning interesting and this Paper Plate Multiplication Wheel is a simple idea that adds a hands-on element to what children might otherwise find rather dry and boring learning. The wheel is made simply by layering two paper plates. The addition of a flap at the side makes it self correcting – the child can check their answers as they go. Of course you can adapt the format of the number sentence to suit how you say your tables – 7×3= or 3×7= by adapting the location of the cut out hole. 1. 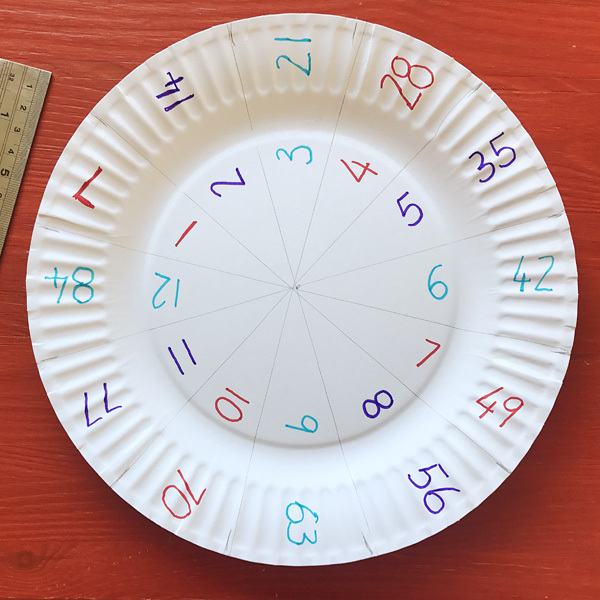 With the pencil and ruler, divide one paper plate into 12 equal sections. This is the base plate. 2. Label each of the twelve sections with a marker pen as shown in the image below. 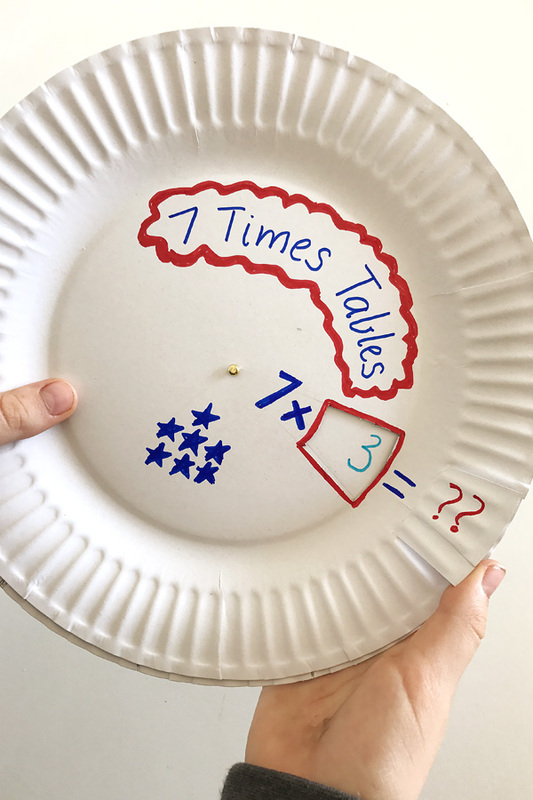 Write the numbers 1-12 around the inside of the plate. 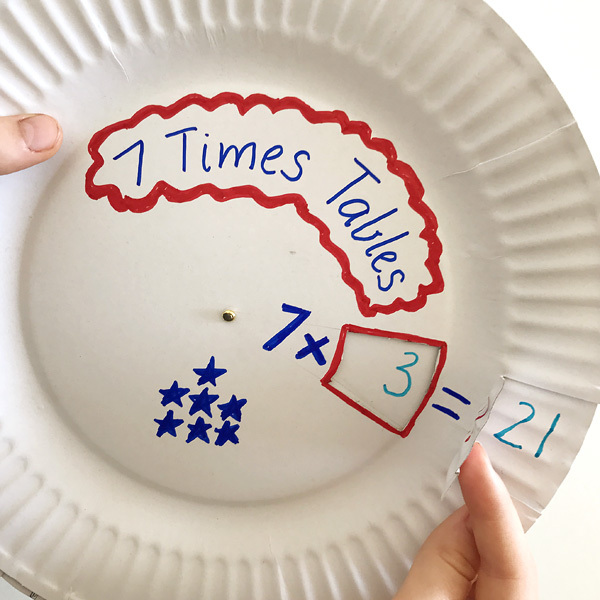 The numbers along the outside of the plate are the answers to each multiplication fact for the multiplication table you are revising with this wheel – in this case, they are multiples of 7. 3. 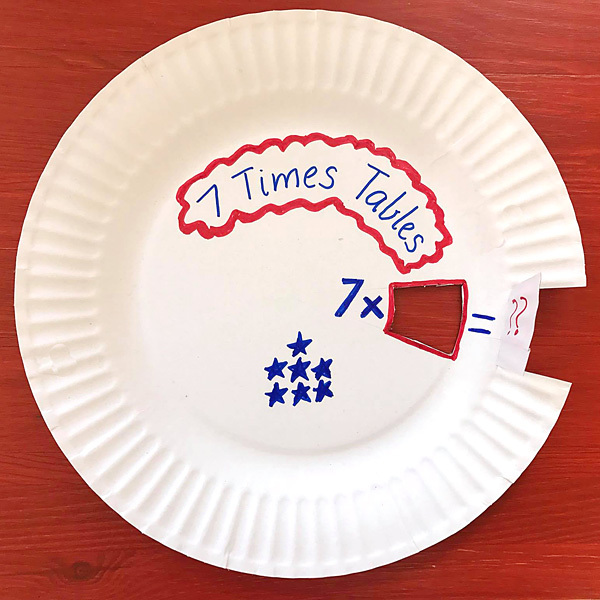 Take the second paper plate and cut a small window that lines up with the numbers around the inside of the base plate (see below). Make two small cuts along the outside edge of the top plate to form a flap. Use the marker pens to then add the rest of the number sentence for your given multiplication table – in this case, 7 x _ = ?? Alternatively, for a _ x 7 = number sentence format, write the numbers one through twelve closer to the inside of the wheel and adjust your cut out window to suit. 4. Place the top plate on top of the base plate and then push the paper fastener through the thickness of both plates and then bend the legs of the fastener to secure. Your multiplication wheel is now ready to play. 5. Repeat for each set of multiplication tables your child needs help revising. 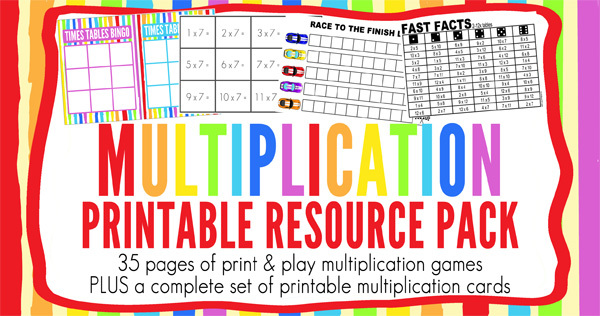 For more fun multiplication games, check out our no prep, multiplication games printable pack. I can't wait to give this idea a try with my kids. Anything to make working on those math facts more fun! YEAH!!! I saw this and made it right away. I actually had the paper plates right next to my computer so I was ready to start right away and just had to go to the basement to get my brass fastener. Thanks for the great idea for our summer learning!!! I have to make a few more numbers! Thanks again!